I was (very much like everybody else) enraptured by Sequentia’s 1993 recording of Hildegard’s “Canticles of Ecstasy“. 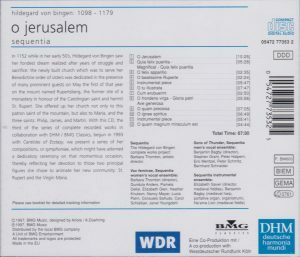 I’m not so taken with this one, from 1997 and the sixth installment in the ensemble’s traversal of Hildegard complete output on Deutsche Harmonia Mundi, launched in 1982 with Ordo Virtutum (first CD publication Deutsche Harmonia Mundi CDS 7 49249 8, barcode 077774924986). Certainly, as interpreted here, the music shares many aspects with its predecessors: the sparse instrumental accompaniment of fiddle, occasionally flute or harp, and alternately portative organ or hurdy-gurdy, and often reduced to droning, the ethereal women’s voices, the mystical meditativeness. But here, despite two purely instrumental tracks (5 and 11) and although the antepenultimate track is sung by men, there is less diversity because most of it is sung exclusively by chorus (only track 2 by solo voice) and with far less dialoguing of soloist and choir (only in tracks 7-9 and 12), and, more decisively, because, stylistically, the music (or the way Sequentia sings it) is much closer to Gregorian chant, psalmodic declamation on a limited and slow-moving melodic compass, with long spans purely a cappella (tracks 2 to 4, 8, 10). So, at times, despite the beauty of the mystical meditativeness, the monophony of Hildegard’s music, if you’ll excuse the pun, tends towards… monotony. Sure, you don’t necessarily expect mystical and meditative music to rock, but for those seeking musical pleasure before an aid for reaching the 72th level of separation from oneself, Canticles of Ecstasy offers more rewards. I’ve compared the two pieces shared between this disc and the one by the Gothic Voices on Hyperion which, in the early 1980s, together with those of Sequentia, launched the Hildegard revival (or should I say “resurrection”? ), “A Feather on the Breath of God”, Hyperion CDA66039, barcode 034571160399. The music is the same but in “O Ierusalem” the interpretations and sonic perspective are quite different, chamber-like and with an alternation of solo and (small) chorus with Gothic Voices, purely choral, more “mystical” and church-like with Sequentia. I have no preference, both are beautiful. The difference is even more pronounced in Ave generosa (which starts here at 1:47 in track 8), with Sequentia now alternating between solo and choir, and Gothic Voices giving it to the bare, unaccompanied solo alto of Margaret Philpot. There’s more seductiveness in the greater lushness of Sequentia, but the very bareness of Hyperion’s version has its appeal too. Erudite and informative liner notes, TT 68 minutes. But if you have only one CD of music of Hildegard, or only one by Sequentia, it should be Canticles of Ecstasy rather than this one. 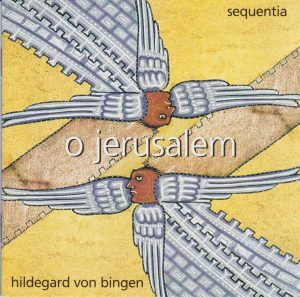 For more Hildegard by Sequentia, and more recordings of Sequentia, For see my Sequentia complete CD discography.